As I have chosen a speed controller used In Radio controlled applications the information sent to the speed controller to control the speed is provided by the receiver, so I will use a Servo tester. 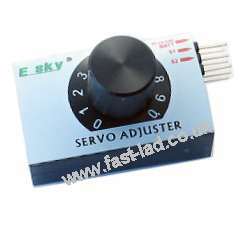 The servo tester is a small off the shelf unit which plugs directly into the speed controller and has a dial to control the speed; this later can be adapted so a standard hand held throttle trigger will turn the dial and set the desired speed. This is an example of one but there are many different products available for very little money. I decided to use a scalextric controller, i had to hack the internals and implant the servo tester. I also fitted a tacho to the throttle unit to measure the prop speed, this uses a hall sensor on the prop hub.